Urban continuities across Asia reveal unexpected family resemblances. At first glance one wonders what could possibly connect a city like Mumbai to Tokyo, except for their dense demography and the speed at which they grew? They are worlds apart in terms of technological and infrastructural standards. Yet there are also striking similarities. In contrast to other comparable planned cities in Europe and America, large parts of Tokyo appear messy at first sight. For better or worse, Tokyo’s planning rationalizers could never manage the city’s rapid demographic expansion and urban spread. The city largely grew out of their control. The largest urban agglomeration in the world is not master planned. It grew largely incrementally and was retrofitted with state of the art infrastructure and urban management systems. The mixed-use, low-rise and high-density of Tokyo’s neighborhoods didn't happen by design. Private and public agencies negotiate labyrinthine inner roads and unexpected twists and turns, and nearly all neighborhoods have state of the art infrastructure. Tokyo’s administrators took for granted the notion that infrastructure must be adapted to the existing habitats rather than the other way around. This seems commensensical but it is actually quite radical in the context of India where the provision of infrastructure is often used as an excuse to bulldoze and redevelop neighborhoods. The universal provision of water systems, electricity and optical fiber in Tokyo is a proof that retrofitting is possible in virtually any urban environment, no matter how dense and convoluted. The ‘Tokyo model’, historically combines the construction of small houses at the neighbourhood level by artisans and contractors, a great number of small businesses operating from residential neighbourhoods, and the provision of good quality infrastructure by state agencies. This explains why Tokyo has some of the best urban infrastructure in the world and a housing stock of great variety. While the buildings have been incrementally upgraded over time by their owners, the visual aspect of most residential neighborhoods remains complex or ‘informal’. They often have extremely narrow and meandering streets that confuse the hell out of visitors, and are lined with tiny houses ranging from futuristic to shacky, made of concrete, steel, prefab materials, metal sheets and wood. Historically, mixed-used zoning happened simply because there was no way of enforcing functional segregation in such a large and dense city. Jane Jacobs observed many positive outcomes of mixed-use urbanism – vibrant street life, a sense of safety provided by the presence of people in the street, and local economic activity. In contemporary Tokyo, it is common to see small residential structures hosting businesses such as restaurants, shops, laundries, bakeries, public baths, martial art schools, massage cliniques, bars, print shops, artisans, accounting firms, designers and architects’ studios, and so on. This is partly due to fact that they have always been part of the fabric of neighborhoods. Something we see in various degrees across Asia, and that is very much part of the reality of Indian cities. When thinking about the future of Indian slums, should we not look East for inspiration? 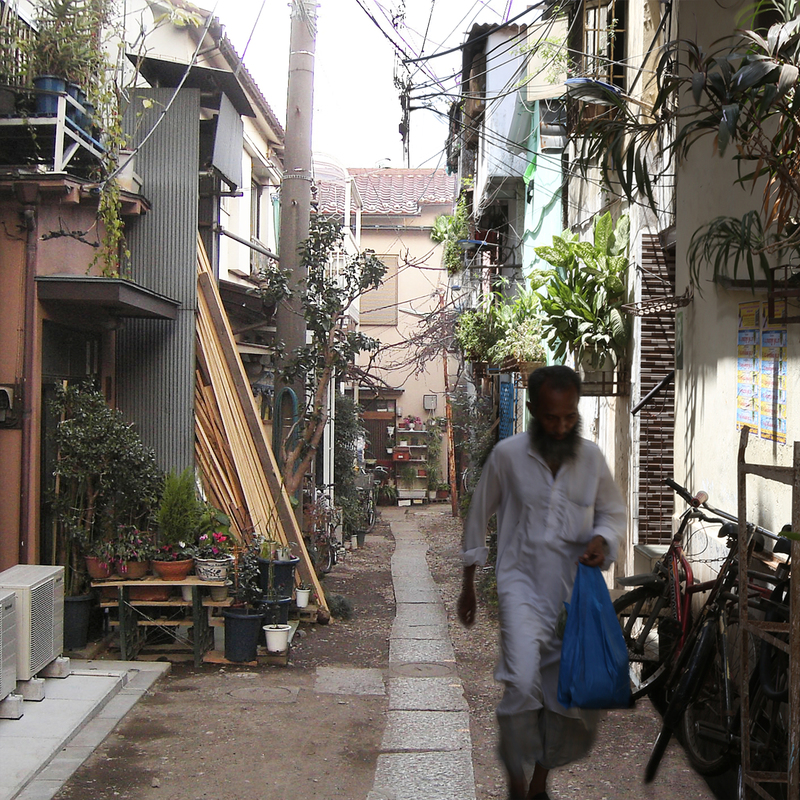 Photo collage of a Tokyo street (Ikebukuro on the left) and a Mumbai street (Dharavi on right).